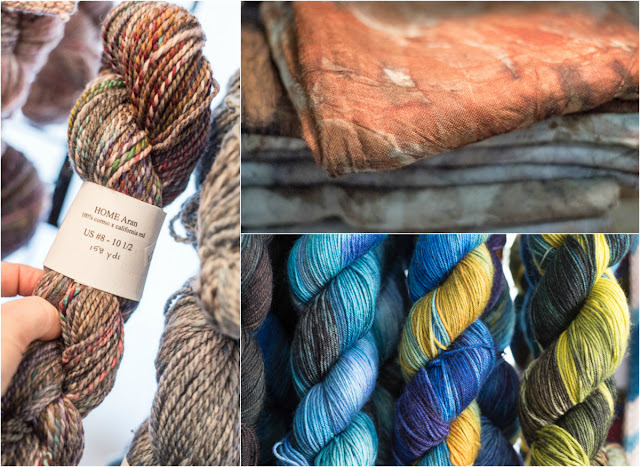 New York Sheep & Wool was a daytrip for me this year. It was, as you've no doubt gleaned elsewhere, unseasonably warm. Also unusual, I only had dark sunglasses (prescription, I am Ms Magoo), no normal specs, so my picture making was...interesting. SO. VIVID. With sunglasses turning things extra bright, I peered over and saw that indeed, longtime fave Nanne Kennedy of Seacolors solar dyed up some strong hues this year at her farm. Love love love. It's always all about the people and What They Are Wearing, for me. More love love love. There's the full view of Cal Patch* of Hodgepodge Farm and friends from the Ulster County Spinners in their Dottie Angel Frocks. Head-to-toe handmade love. The talented and beautiful Kristy Glass, first thing in the morning when one could wear wool...for a bit...in the shade. 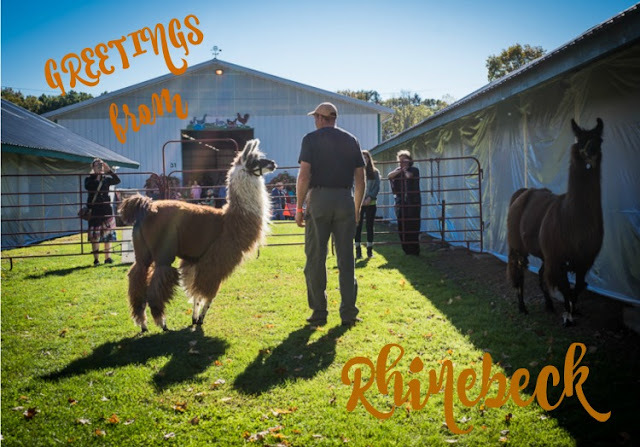 Her YouTube channel has this year's 90+ minute Rhinebeck Sweater roundup online already...get your popcorn and settle in. She's the best knit world interviewer/supporter/video star. She interviewed me about the shawl I was wearing. My sweater stayed in the car. I'd declare Yoked Sweaters the Big Thing this year and Boyland Knitworks Sunset Highway the most worn. Things I didn't buy but will:(L) White Barn Farm's gorgeous Home yarn, in the colorway Remains of the Day. 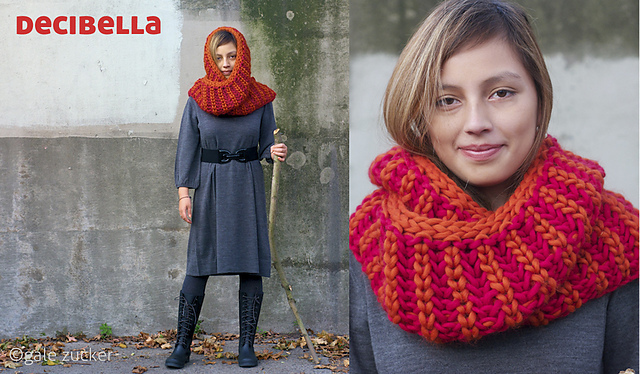 Will be ordered as soon as I choose the pattern it deserves. 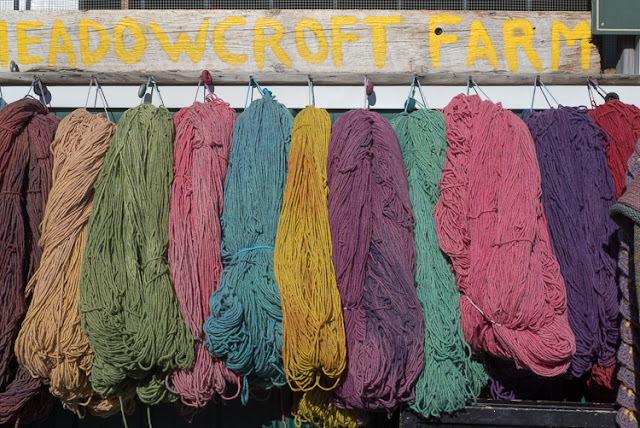 (top R) Eco dyed woven wool from Rwanda, at the Umva LongRidge Farm booth. 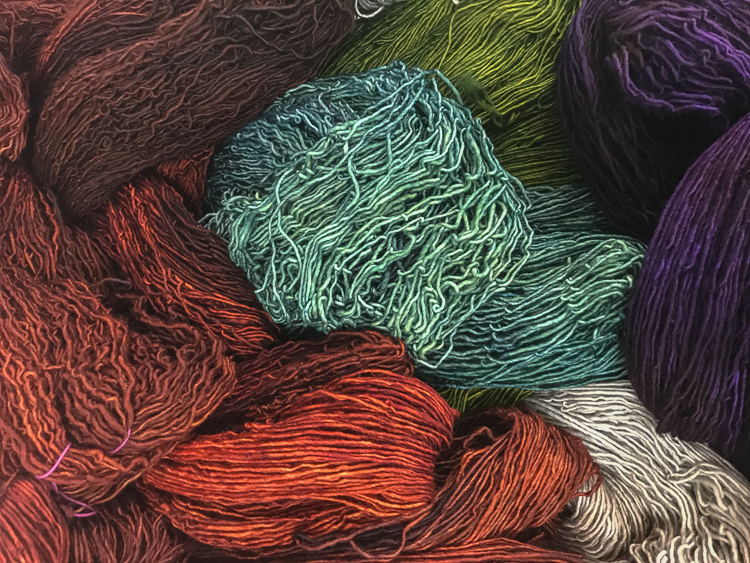 bottom right: Dragonfly Fibers. Swooooon. 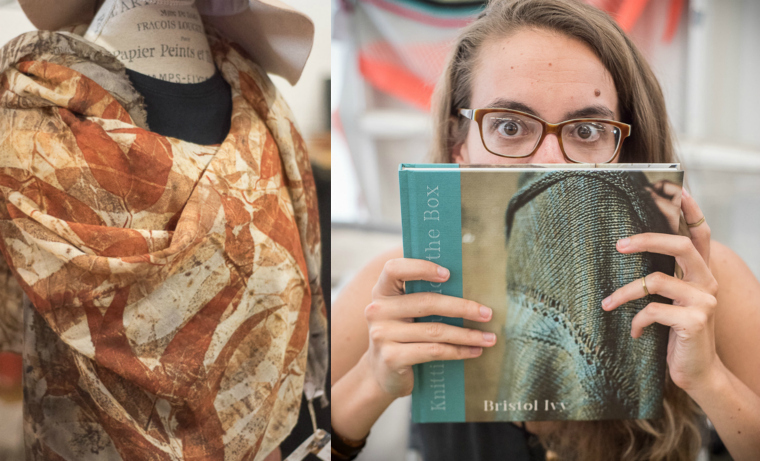 Another view of an Umva shawl, and then, something I DID buy, Bristol Ivy's stunning book Knitting Outside the Box. The designs are like her, beautiful and smart. The book is gorgeous and full of skill building, thoughtful, inspiring essays on ways to make innovative shapes and drapes. In my fantasy world, I take it with me to a cabin in the woods on a snowy weekend and dig in, by the fireplace. Here's Beverly and Thea Colman, Ms Baby Cocktails herself, at the Jill Draper Makes Stuff after party. 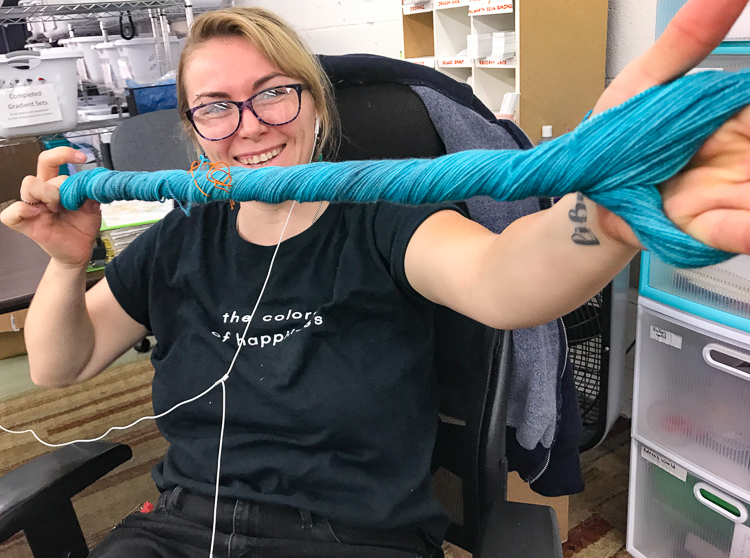 Thea's helping Beverly choose yarn to make her newest release Rye and Rum Punch--not that you can see much of it, but Thea is wearing it. She helped select the contrast colors in Windham. This was vicarious shopping at it's best, I am crazy about that sweater. To the queue! More from Jill Draper's** studio in Kingston---clockwise from upper left: Jill Draper herself, looking 1940's glam, Misa Erder and Karen Clark (ChooChooKnits) in a mind boggling show of knitting genius. Misa designed and wore her cowl Market Day. Karen surprised her by sweaterizing it. (!!) On the bottom left, Misa considers two Empire bumps. 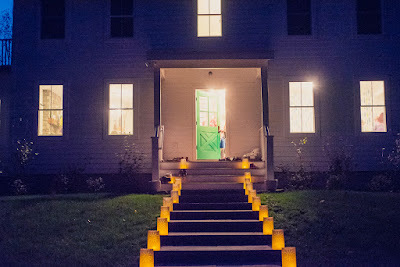 This photo, made in a dark-ish corner at dusk, doesn't do credit to Jill's dyeing. That one on the right was SO GOOD. Something like this but, y'know, even better. 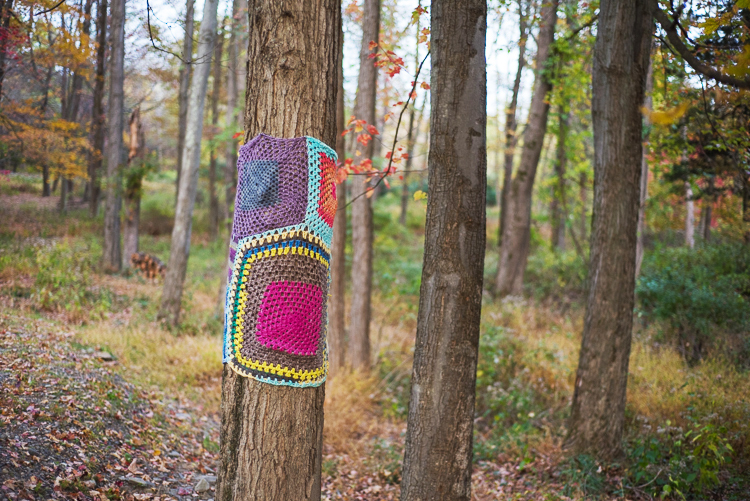 Being the bon-vivants that we are, next stop was the Mason Dixon Knitting MDK Pie and Cider Party in the woods. It was a no shoes party. 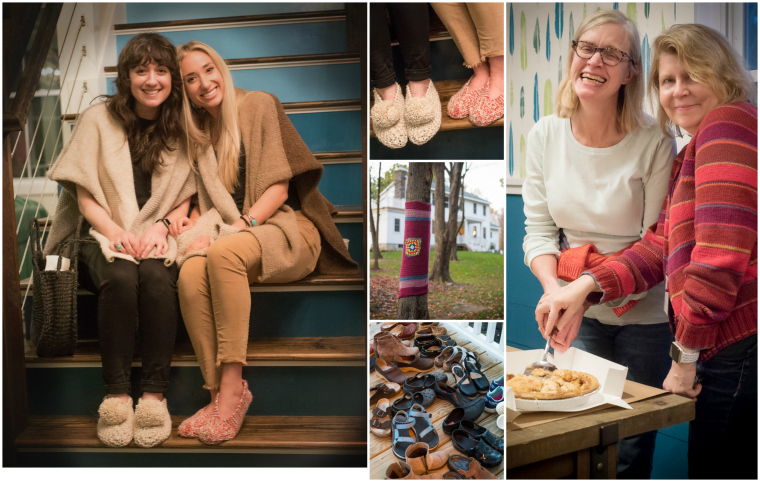 The lovely The Wooliers sisters won Best Prepared, in their knit slippers. 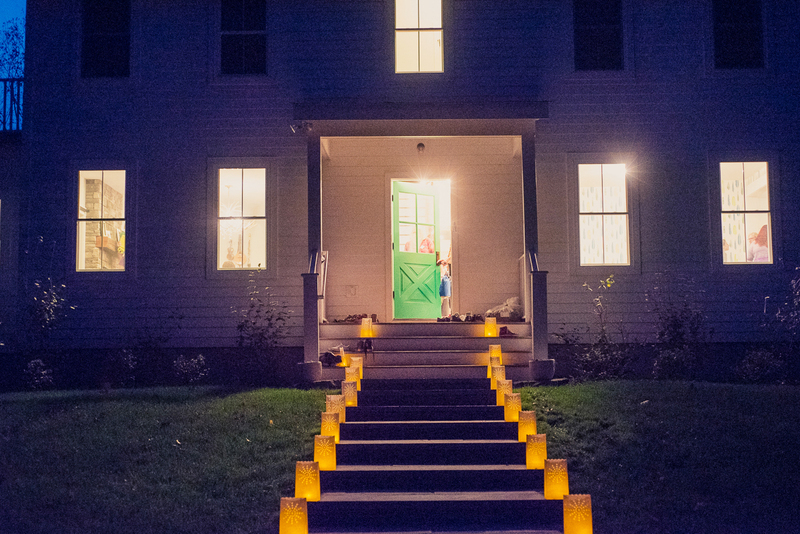 Check out that view of the shoes on the front entry porch: in which we confirm the Venn diagram for MDK and Wearing Clogs is almost totally overlapped circles. Notable exception, my high rise Tevas. My motto: Sandals till the freeze forces me into boots! Ann and Kay cut the pie, the cider flowed. It was a lovely way to end the day. * Cal is an amazing maker and teacher--that link is to her etsy shop but you might want to surf around and see if you can take a class from her, or find her vending at a holiday market. 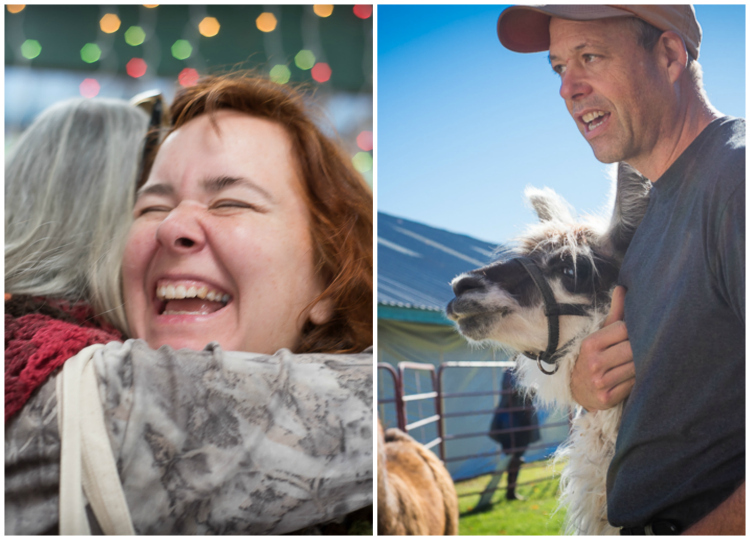 1) I never get tired of watching this stop action video compilation I made from the years 2010 and 2012, when I set up a photo backdrop and made photos of what people were wearing to the NY Sheep & Wool Festival (aka Rhinebeck) in Rhinebeck NY. Turn up the sound and wallow with me! Also feel free to post it elsewhere, I love sharing this. 2) Like so many photography projects I do, the end result isn't exactly what or why I started it. I thought it'd be about what everyone was wearing in all their woolly knitting fiber freak flag glory. (It is...but...) It's really about community and happy. 3)This weekend the annual festival happens again. The weather's not very sweater-friendly, although I bet the morning will be chilly enough. And maybe the barns..... but I don't care...do you? Throw on a shawl and work it! I won't be wearing my new brioche cowl, either. It was so so so ginormous, that it now looks like --see above! I care not a bit, love the process of working with this yarn. 1) Two color brioche in the round is now my my mindless knitting. Whaaaaat? I'm not sure when it happened-- I cast on a wide tube of a cowl in early summer. I left it next to my desk. I began picking it up during delays while uploading files or on hold on the phone. I'll be the first to admit my relationship with brioche was fraught. I wasn't the, um, swiftest to get it, as I explained just a few months ago. Now, it's relaxing and I am addicted. Old dog, new tricks ftw. 2) Brioche is a stitch that really lets you play with colors, which I'm guessing accounts for the popularity-- the sides reverse, you can switch color prominence. And, it goes fast, a nice chunky instant gratification. Also? It eats up yarn at an alarming rate. So when I ran out of the Rose and , um lets call it Dirty Ballerina colored Windham, leftovers from my last brioche cowl in April, I put out the bat signal. I (hahahaha) thought I just needed a teeny bit. 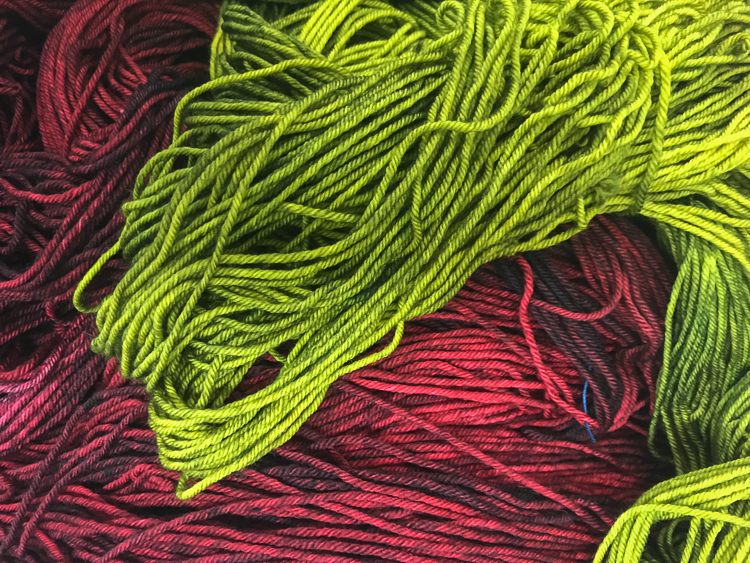 My dear client and friend, the crack designer Elizabeth Elliott sent me lime green and a little dark blue left over from designing her Dionisio Cowl, I like the acid-y lime kick, though its outside my usual palette. 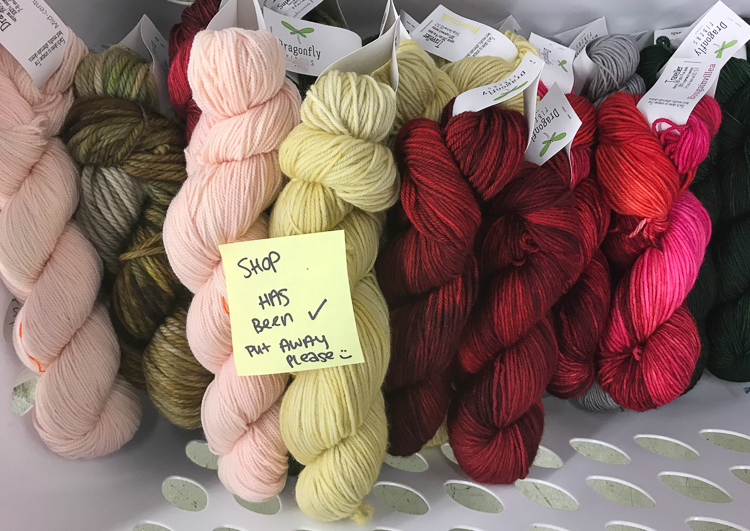 When that wasn't enough, a kind and well-stashed knitter sent me her leftovers after I sought to buy partial skeins from a Ravelry forum. Her colors are everything you see from where the marigold starts. I'm loving all these hues together because I'm a Jill Draper Makes Stuff* fan, and this is like a visit to her studio. Possibly, Zoe's Rainbow Sweater has affected me on a cellular level. Zoe gives this project both thumbs up. 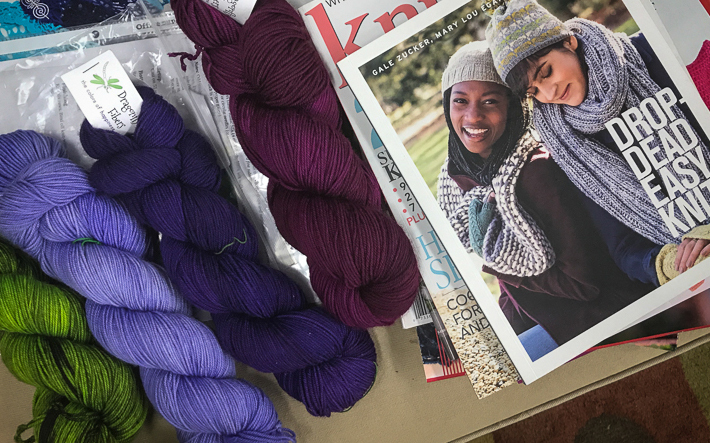 3) Did you know there's an other way to knit brioche stitch, if you don't find favor with all the yarnover wrapping, BRK and BRP? It involves knitting or purling into the row below. 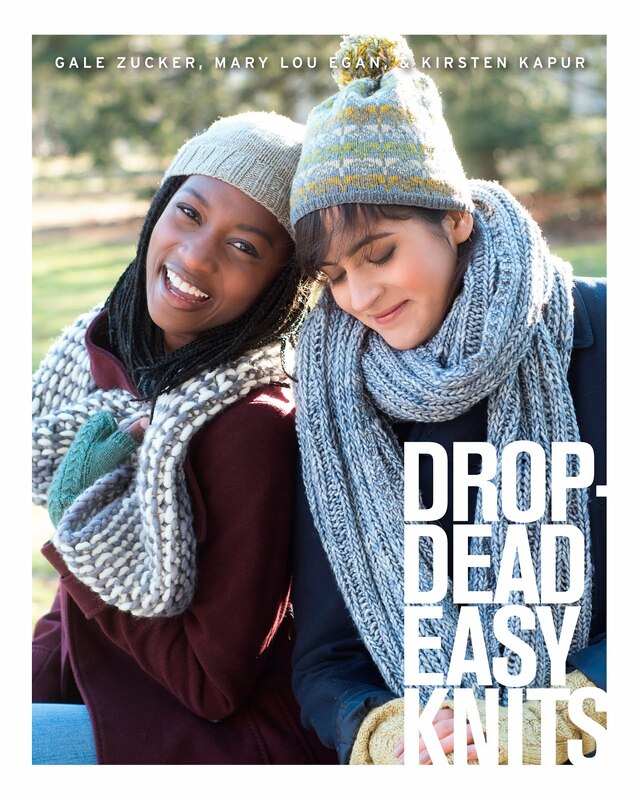 What I find truly amusing about this : Five years ago, I actually designed and still sell a pattern, Decibella, in brioche stitch**, knit in that manner! WHO KNEW? Not me! At the time I thought I'd stumbled upon some sort of faux brioche/fishermans stitch. I even blabbed about it online that way. I crack myself up! 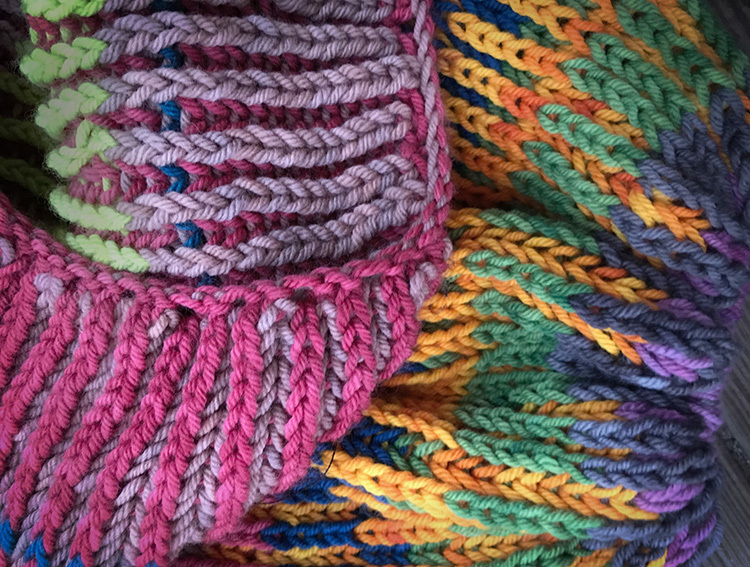 Just recently I saw a class listing for the "Knit or purl into row under" brioche technique. I'm going to have leftovers! * welp, it looks like Jill has just added a whole bunch of really great Windham mini sets to her etsy site, including Dionisio Cowl sets! They weren't there just a couple of weeks ago when I was scouring the internets for just such a thing! I encourage you to treat yo'self. **I'm thinking I might revisit this pattern and come up with something less super bulky. Maybe with pompoms? Or tassels? I am feeling flamboyant this season! 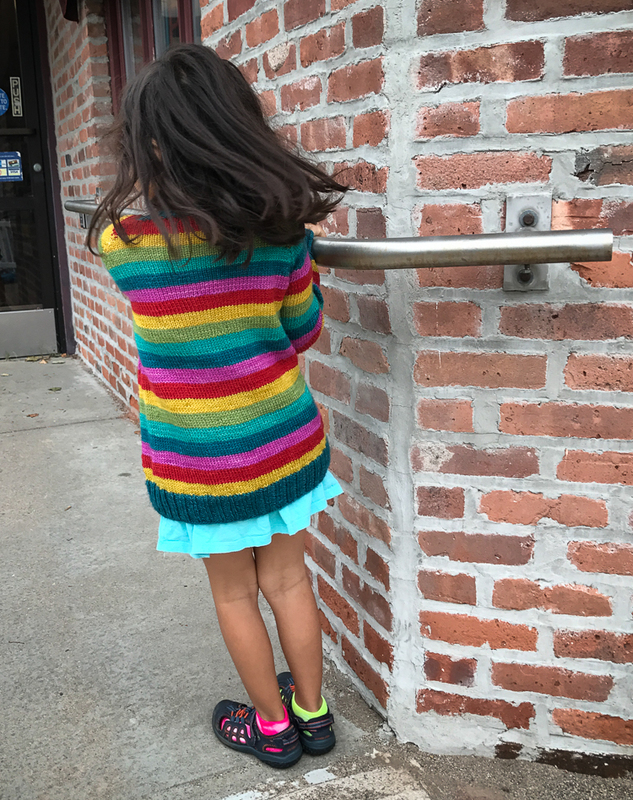 I had the sweetest sweater request: a rainbow sweater. 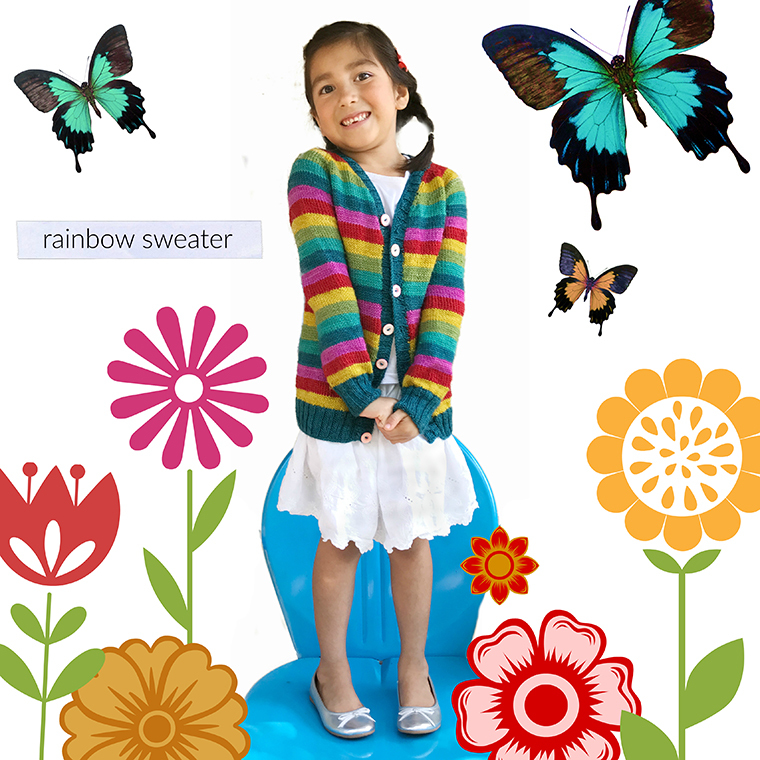 Specifically a cardigan, with traditional V neck men's styling and button band, lower hip length. It had to have most of the rainbow colors but especially pink. And pink buttons. We found the Go Buffalo pattern met all the requirements. Except, of course, colors. A lot of decision making went into this one. Zoe loves wool, but only super soft wool. I love color...but not candy colored rainbow or primary stripes. 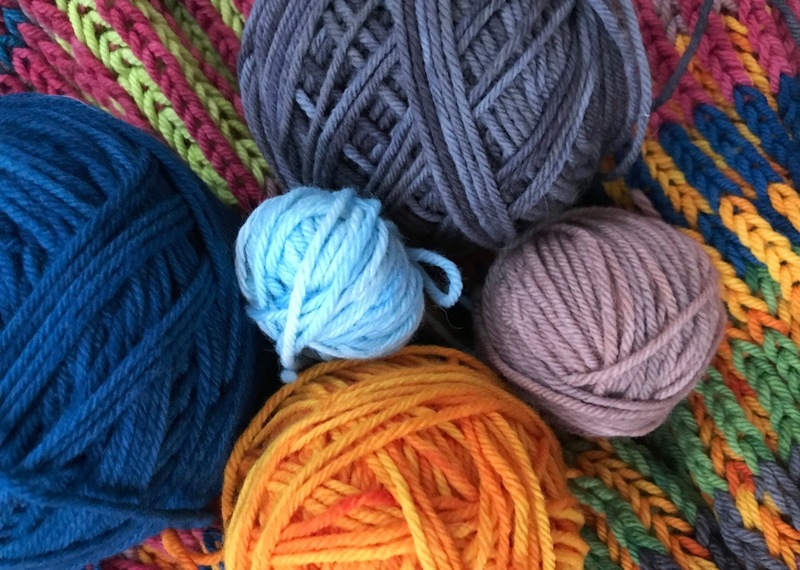 I found a fabulous Frabjous Fibers Wonderland Yarn sport weight Compass Shawl kit that had just the right combo to get me started, with a two shades of blue, a green and a perfect raspberry pink. 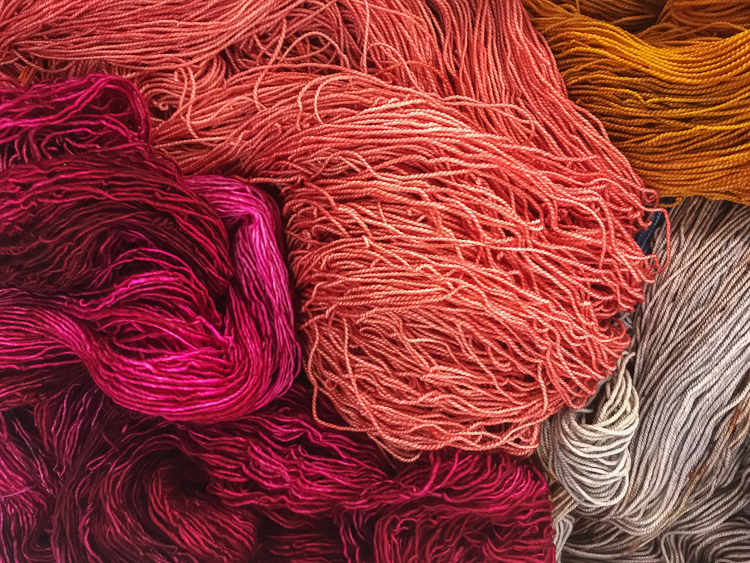 Lovely yarn! The red is some Louet Gems sport left over from Sleight of Hand mittens, and my LYS had the perfect not-too-sad golden yellow- they call it curry- from Swans Island yarn. I hit up Dusty's Vintage Buttons at TNNA--she is at a lot of festivals and is irresistible--and brought home some egg yolk yellow buttons for the cardi. Which were passed over in favor of irridescent light pink buttons I'd also brought home, just for fun. What was I thinking?! 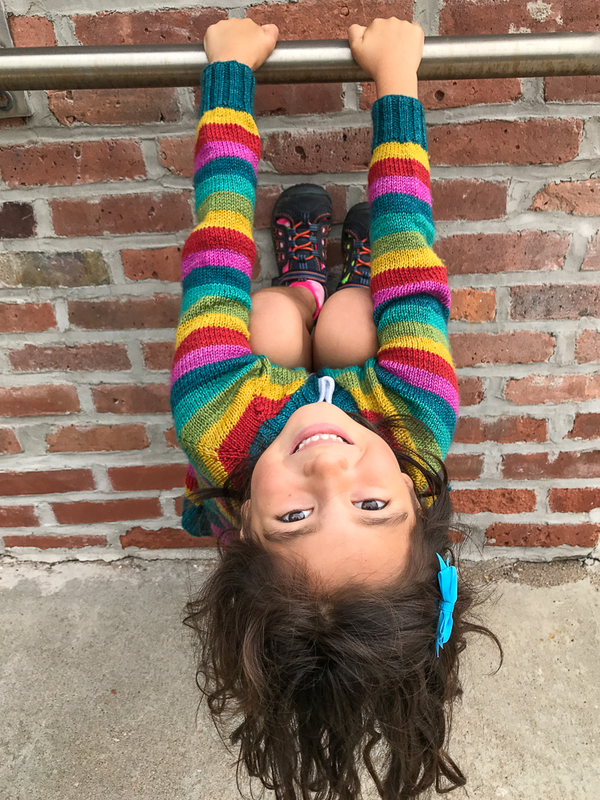 The stripes are six rows wide, and although Zoe is on the average/small for her age, we lengthened the body and arms a couple of inches from the pattern's sizing for her. 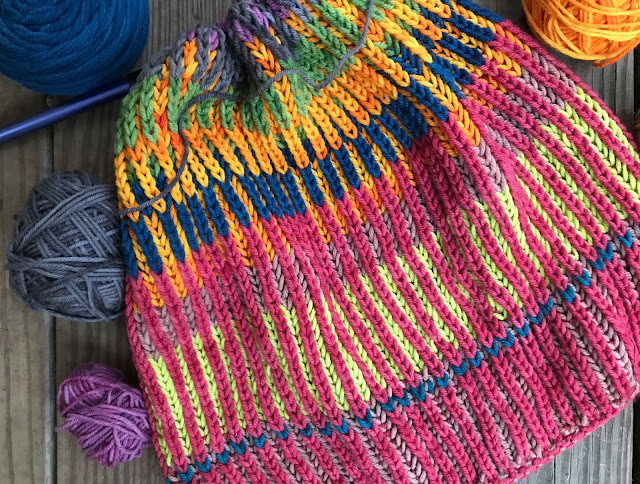 This was my main knitting project in July and August , other than a couple of ongoing mindless pieces I keep around for...umm, knitting mindlessly. Which is my default mode, so this was often put aside. It was easily worth all the color switching and end weaving in to have a finished piece so appreciated by this sweetie. 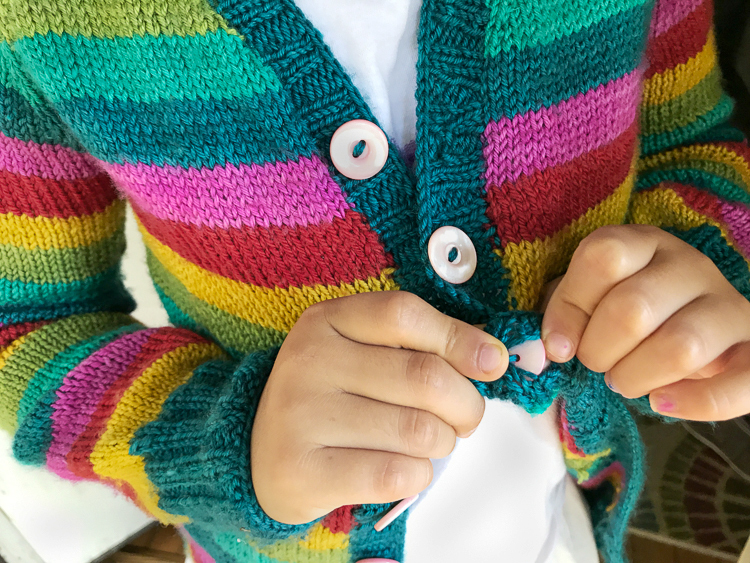 It's been to school, worn over a wet bathing suit, it was even worn before I could get the buttons sewn on. Who could resist such handknit enthusiasm. Not me. 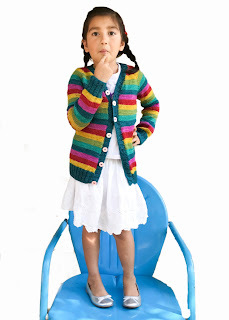 I am now on task to knit a rainbow hat with the leftovers. Above, hanging around the bus stop. Clearly, Zoe knows what she wants in style. Always has. I hope she doesn't cave in to conformity any time soon. Behind the Scenes again! 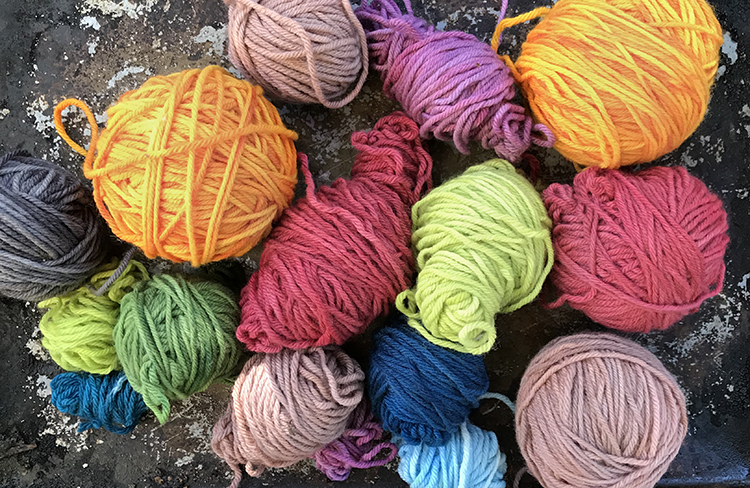 I'm just going to warn you, many distracting yarn photos follow. 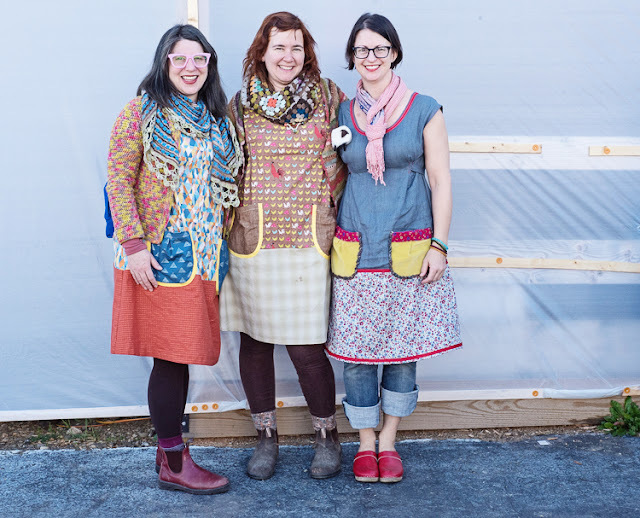 I was at Dragonfly Fibers studio in Maryland last month, for the loveliest of jobs, helping them set up a permanent photo studio at their workshop and business. 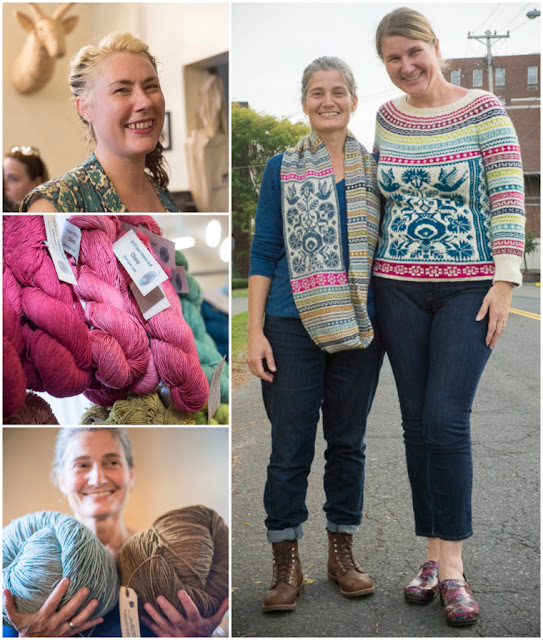 Kate and Nancye make stunning yarn which, distractingly, was everywhere in their headquarters. My head was swiveling around like an owl's the whole day oooh oooh ooooh. 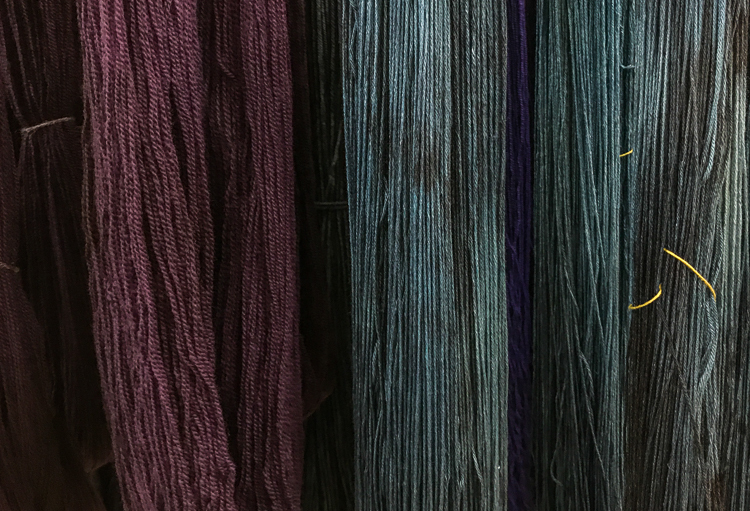 Their yarn is gorgeously dyed on beautiful bases, with brilliant and subtle colors. So their photos need to be reliably lit and consistent, to share the goodness online. I love love love consulting jobs like this, where I can apply my little slice of nerdy-photo- knowhow with talented people. 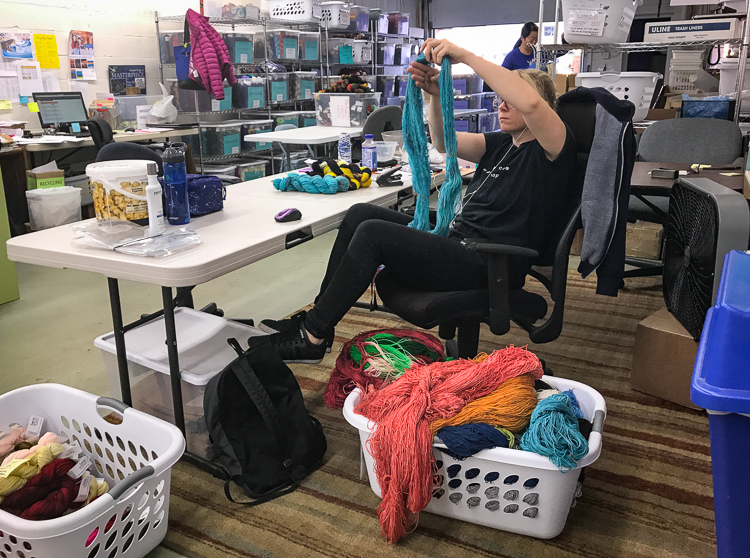 It's mindboggling to look at all the parts to running a successful yarn business. 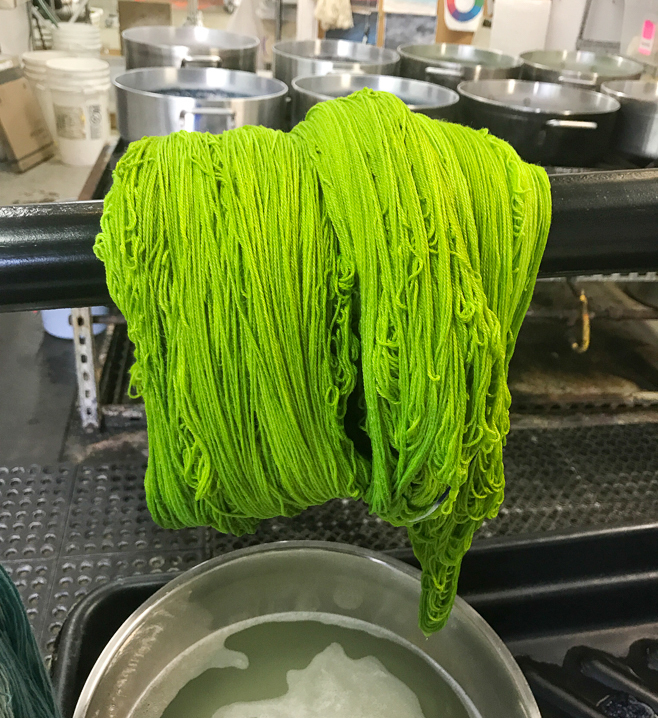 There's sourcing and ordering miles and miles of naked yarn--and then winding it into dye-able skeins. 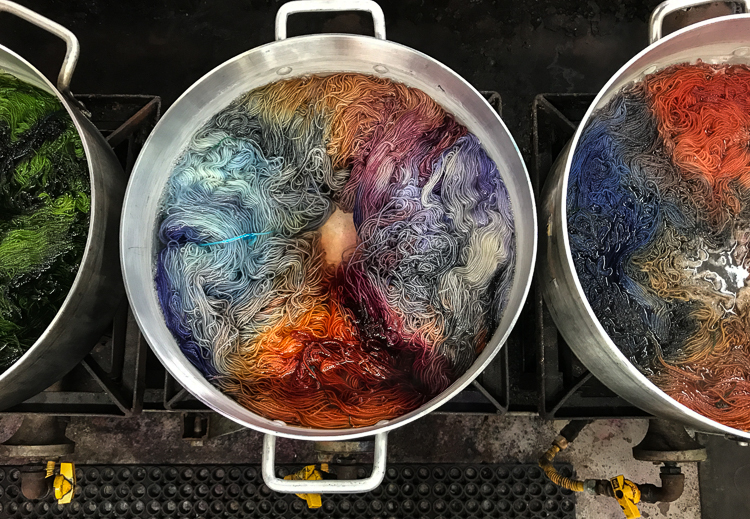 And of course the logistics of dyeing and drying large quantities, and reproducing great colors time after time. That blue with black in it, in the photo above this one, just kills me. Then it all has to be patted and twisted and tagged before it goes out into the world. 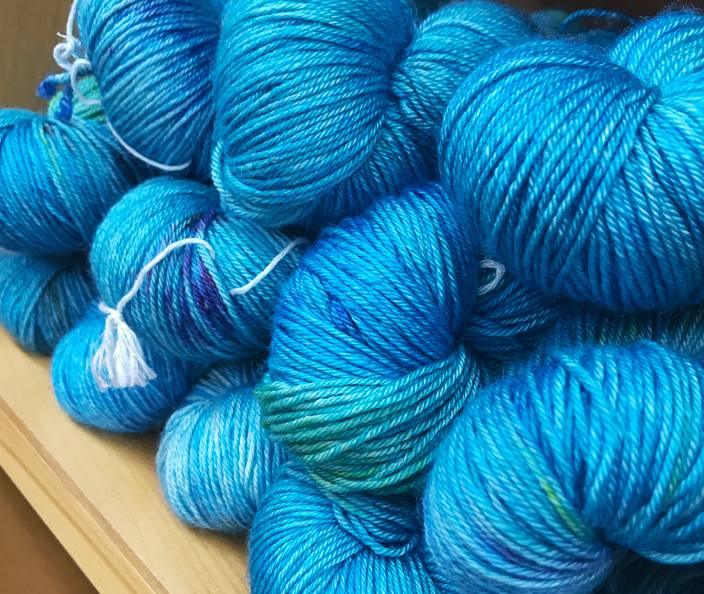 Which seems like no big deal when you've just got ten skeins in a basket. 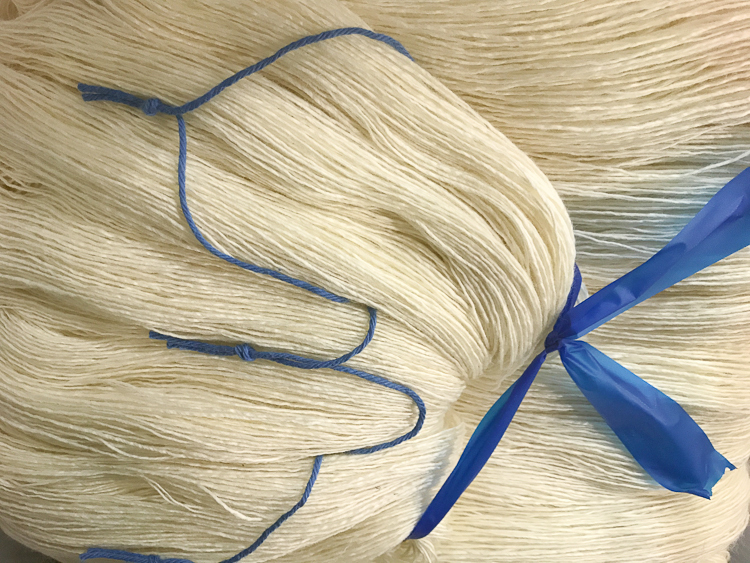 Scale that up to hundreds and hundreds of skeins...and there's a whole lotta twisting going on. It's the organizational side that would kill me, personally. 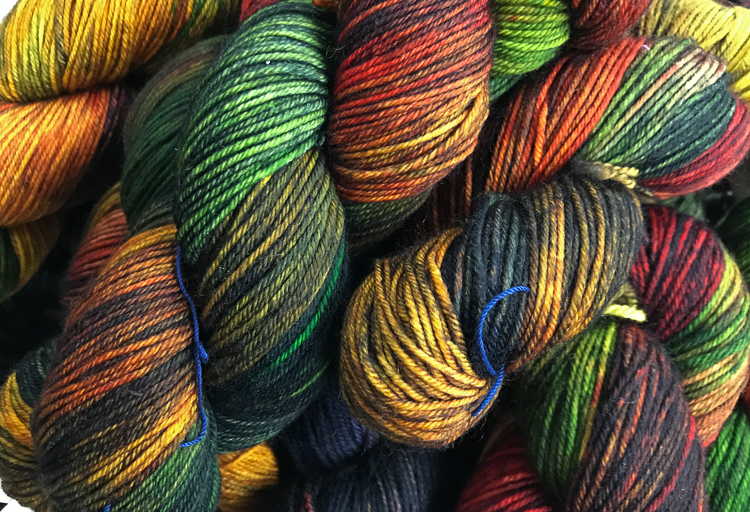 (That and choosing names for the yarns, which Kate has amongst her super powers). So many laundry baskets and storage bins ready to roll. 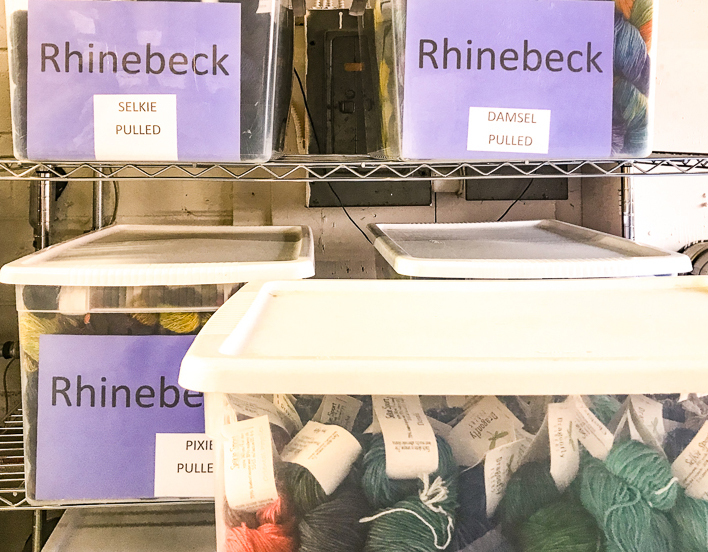 Obvs prepping for Rhinebeck NY Sheep & Wool is going to require many many many bins. Dragonfly Fibers doesn't have a retail shop at their studios but there is an area that is set up store-like, if you happen to be by on a studio visit. That's their colorway Beaches, which stopped me in my tracks. Though I didn't bring those home with me, you'll be glad to know I didn't leave empty handed,. And I managed to control my chronic indecisiveness by choosing one skein and asking Kate to choose a second for me. I'll share it in another post. Oh, ok... spoiler: my beauties are Low Tide and Poseidon, which tickles the mermaid in me no end. A very very good version of Christmas ? I swear this was just sitting around. Love love love love love. 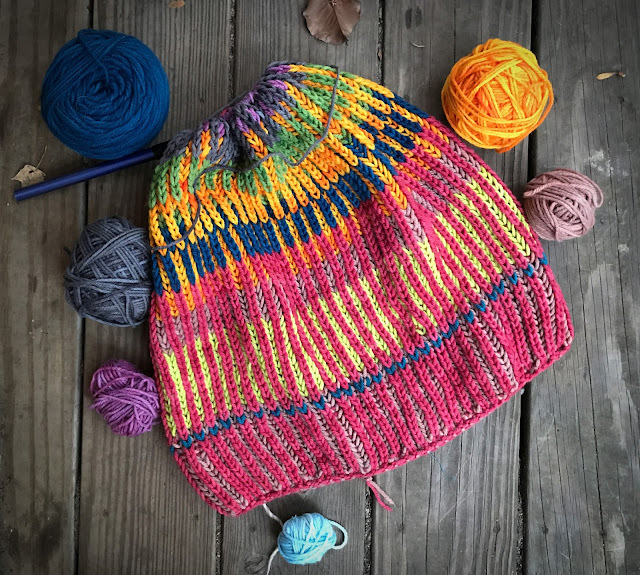 We used their yarn in a couple of projects in our book , and I've since knit my favorite hat from Drop Dead Easy Knits, my Sidekick in their yarn. 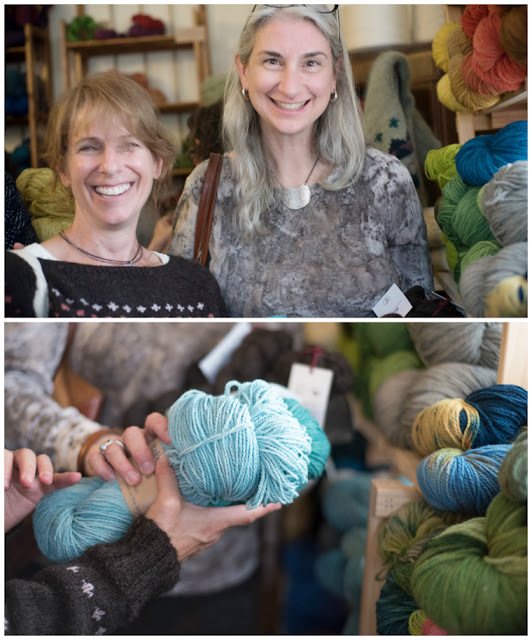 Dragonfly Fibers yarn is stocked in many shops, and of course they sell online, but if you happen to be at festivals this season...definitely stop by. PS. They are killing it with the new photo studio we set up, as seen on Instagram yesterday. When they launch a new website, prepare to be wowed!